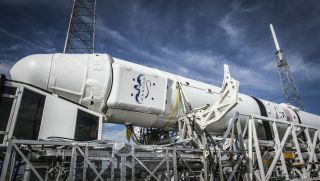 SpaceX will attempt the first-ever ocean platform landing of reusable rocket stage during the Jan. 6, 2015 launch of its Falcon 9 rocket and Dragon cargo ship. See photos from the mission here. SpaceX's Falcon 9 rocket launches from Florida's Cape Canaveral Air Force Station on Jan. 10, 2014, sending the company's unmanned Dragon cargo capsule toward the International Space Station for NASA. Read the full story here. SpaceX's fifth Dragon cargo ship for NASA separates from its Falcon 9 rocket after successfully launching into orbit on Jan. 10, 2014. The spacecraft will arrive at the International Space Station with supplies on Monday, Jan. 12, 2015. Read the full story here. In a first for space flight, SpaceX will attempt to fly its Falcon 9 booster rocket to a safe landing aboard an offshore platform. See the full infographic here. SpaceX's CRS-5 mission is scheduled to launch on Jan. 6, 2014, from Cape Canaveral Air Forcce Station in Florida. Four hypersonic grid fins on the SpaceX Falcon 9 rocket will assist in precision landing. SpaceX's "autonomous spaceport drone ship" measures 300 by 170 feet (91 by 52 meters) with its "wings" extended. On Jan. 6, 2015, SpaceX tweeted this photo of their Falcon 9 rocket on the launch pad at Cape Canaveral, Florida, 60 minutes before the scheduled launch of the CRS-5 mission to the International Space Station. On the morning of Jan. 6, 2015, NASA's long range cameras caught the International Space Station flying overhead shortly before the SpaceX Falcon 9 rocket was scheduled launch from Cape Canaveral, Florida. On Jan 6, 2015, SpaceX tweeted this photo of its Falcon 9 rocket awaiting immiment launch from Cape Canaveral, Florida, on a mission to the International Space Station.